This is the only developed park in Cave Junction and is used for several annual events and special activities such as baseball tournaments and Concerts in Parks sponsored by the Chamber. 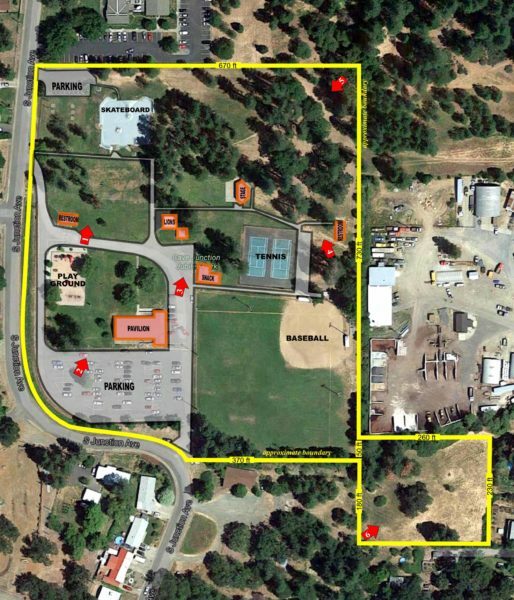 Map showing the boundary (yellow line) of Jubilee Park in Cave Junction, Oregon. The numbered red arrows correspond to the numbered images below. Click image to see an enlargement. A photo taken near the playground shows the restroom on the right, skateboard park in the distant center, Lions Club hamburger stand (brown boarding on the right) and snack bar on the far right. Click image to see an enlargement. Photo taken from the main parking lot shows the playground in the left background, pavilion in the center right and baseball field on the far right. Click image to see enlargement. The skateboard park is seen in the far left background with the Lions Club hamburger stand and metal shelter in the left foreground. The stage is in the center background with the chainlink fence around the tennis court next to it on the right. The snack stand and baseball field are seen on the far right. Click image to see enlargement. A photo taken near the baseball field backstop looks north with the east boundary of the park and restroom on the right, tennis court on the left, and stage in the background left. Click image to see enlargement. Photo taken from the northeast corner of the park shows the east boundary fence is seen on the left and north boundary fence on the right. The stage and tennis courts are visible in the center background. Click image to see enlargement. This photo shows a small and isolated parcel of land in the southeast part of the park. Click image to see enlargement.